We’ll be using a simple copy and paste code snippet. Please only do this if you know what you are doing. 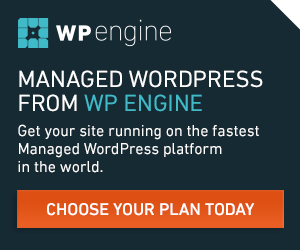 AND only do this after you have made a full backup of your site. Just in case you break something.Editing code can be dangerous!!! Update! 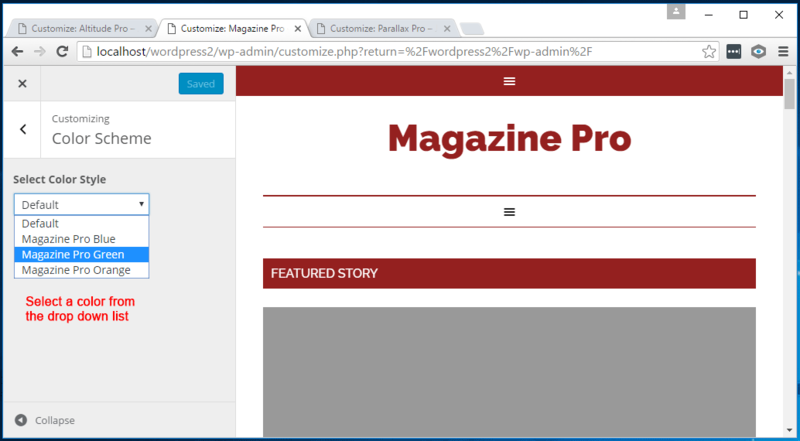 Since I made this tutorial WordPress have added the Additional CSS option in the Customizer. Paste your code in there. If you want more space to paste your code, so you can see what’s going on better, use the Simple CSS plugin. Download, scan and unzip the CSS snippets. If you understand CSS you can use the DIY Version to make your own color schemes. In this tutorial we’re just going to copy and paste the “Ready to Use Code”. Open the folder containing the color you want to use. 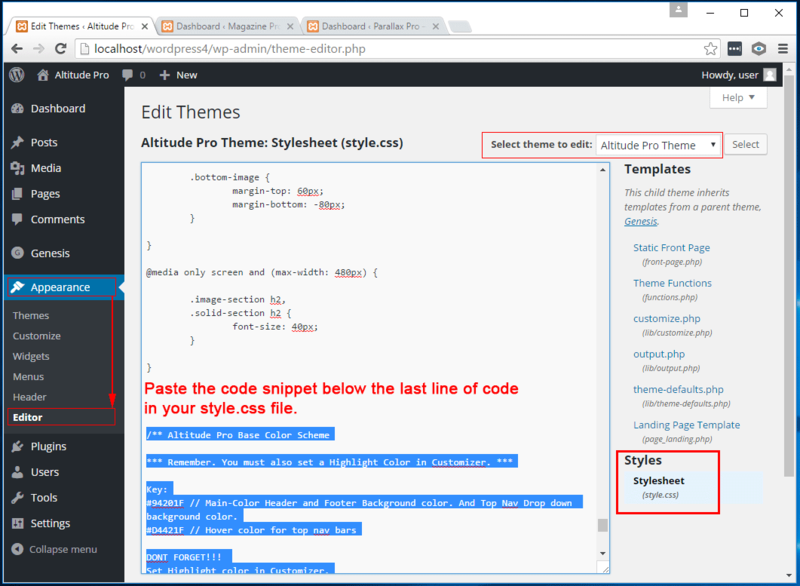 Then open the code snippet for your theme. 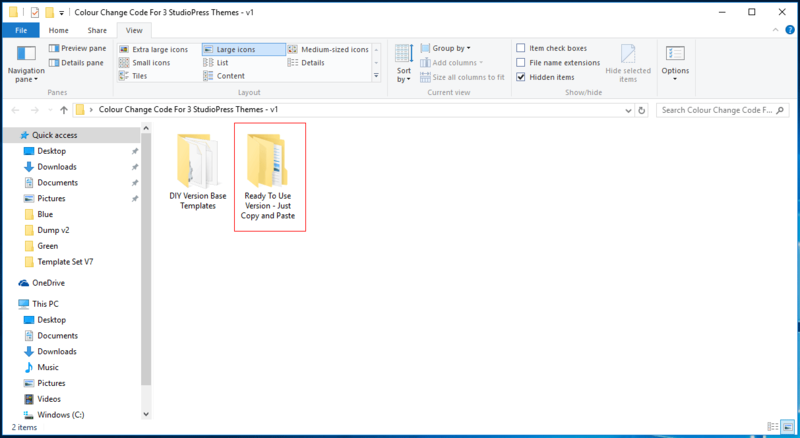 Ready to Use folder > Blue Folder. 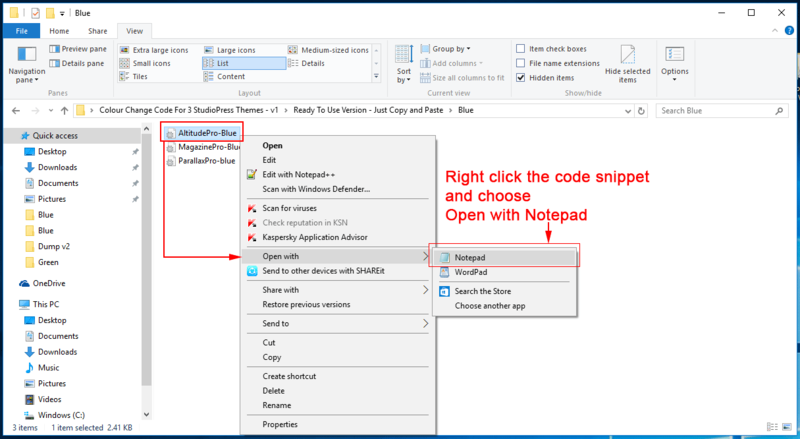 Then open the AltitudePro-Blue code snippet in a text editor such as Notepad. It is important that you open that code snippet in a plain text editor such as Notepad. Do NOT use Microsoft word. Place your cursor inside the code snippet and press Ctrl + A to select all of the code. Then press Ctrl + C to copy the code to your clipboard. 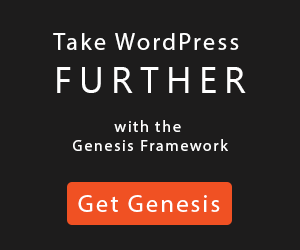 In WordPress go to Dashboard > Appearance > Editor.Make sure you are editing the style.css file for your chosen theme. Scroll to the VERY bottom of the code. 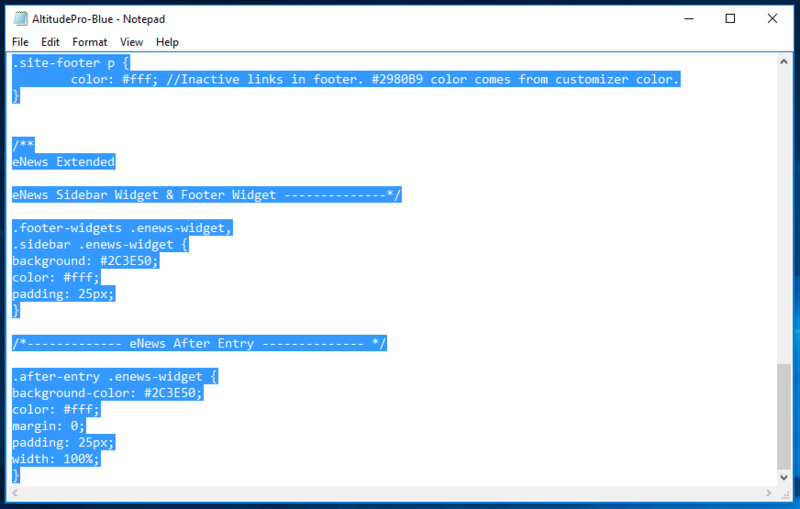 Place your cursor AFTER the last character of code, in the editor. Press Enter 3 times to make some space, so you can easily tell where this extra code snippet has been added. Just in case you want to remove it later. Click the big blue Update File button. 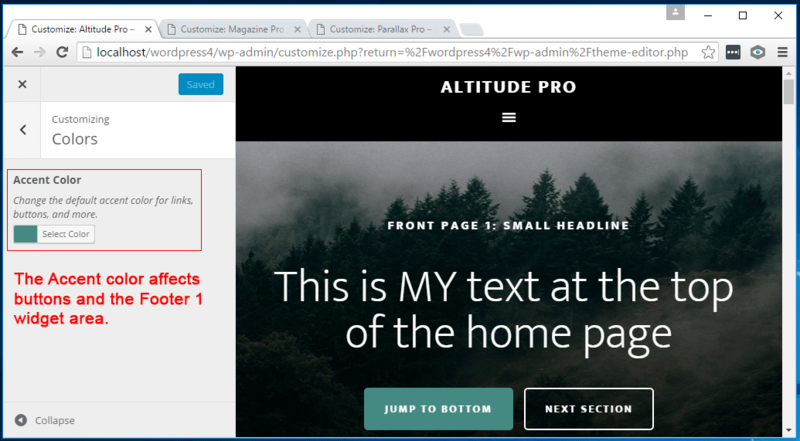 The text links in buttons etc are set via the WordPress Dashboard. Dashboard > Customize > Colors or Color Scheme. In altitude Pro you can set the exact color using a color picker. 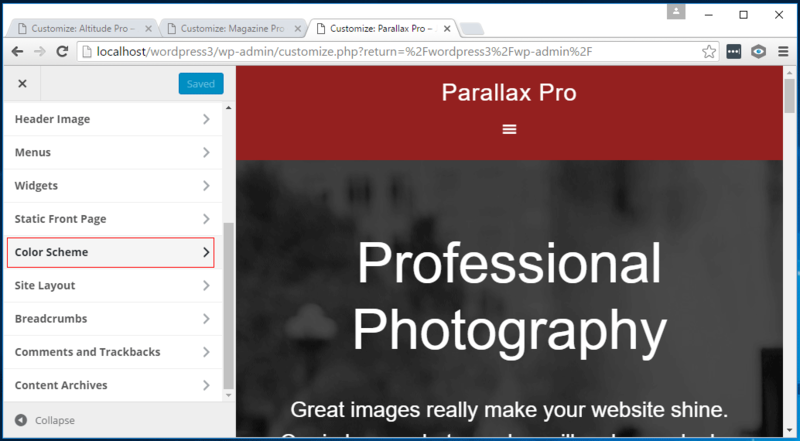 In Parallax Pro and Magazine Pro, you choose a color from a drop down list. Refresh the front page of your site. Press Ctrl + F5 if necessary. So that your new code becomes active and you can see the changes in your browser. Your website now has it’s own color scheme. Why not show it off to your friends? 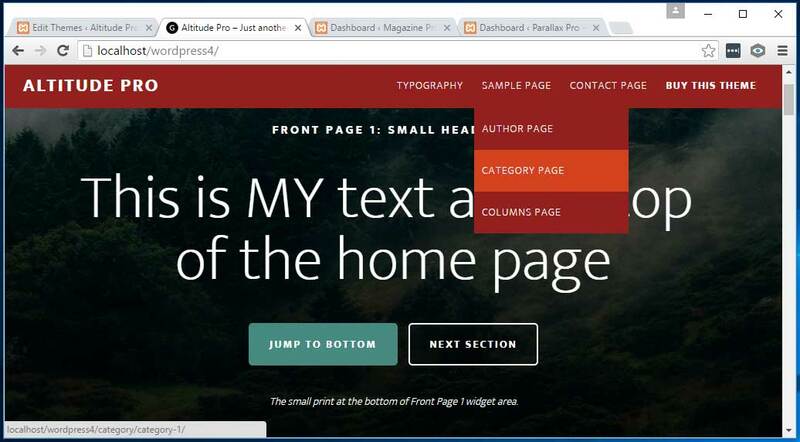 MainColor: Main top navigation bar and footer. RollOver: Hover Color for drop down links. TheButtons: Buttons that site visitors click when they want to add comments to your site or sign up for your newsletter. Adobe Color is a good place to find Color schemes. Open the DIY Version in Notepad. All three themes have another option that needs setting. 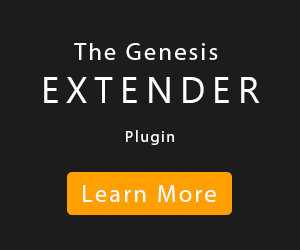 Do this after you have edited and pasted the code snippet. Appearance > Customize and choose Colors or Color Scheme. Here you can choose a highlight Color to go with your new Color scheme. Experiment to see which Color looks best. Depending on your theme, there will be a Color picker or a drop down list where you can choose a Color.